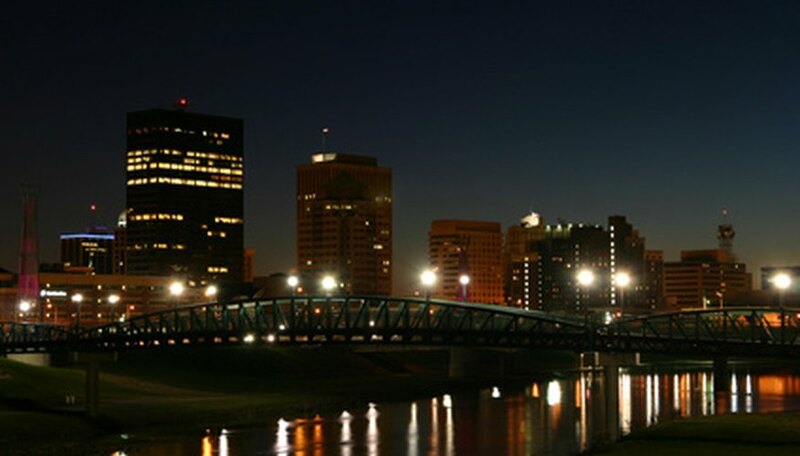 Springfield, Ohio, is a city home to about 62,000 residents and close to 3,000 college students. Though Springfield is large enough to include all of the amenities associated with city life, it also includes activities and outings suited for small-town budgets. If you're looking to impress someone special with a memorable and unique date, Springfield's array of historical sites, wilderness trails, and local exhibits provides enough variety for everyone's tastes and budgets. A view of the Springfield nighttime skyline. Springfield's old City Hall and Marketplace was turned into an all-inclusive museum, exhibition hall, library, and meeting space. Permanent exhibitions outline the history of Ohio, as well as directions for the future of Springfield. Take your date on a free self-guided tour of the museum and then head to the Central Perk Cafe for an affordable lunch. The Heritage Center frequently rotates its temporary exhibits so be sure to check the Center's website for the most up-to-date offerings. Stop by the library, the Chamber of Commerce, or any hotel with a welcome station to pick up a free brochure for Springfield's Public Art Tour. The self-guided walking or biking tour leads you around the campus of Springfield's Wittenburg College, where several sculptural art pieces are on public display around the college grounds. The tour also takes you through Springfield's downtown area, where you can stop for a quick and cheap bite to eat. Even if you aren't an art lover, the tour gives you a chance to explore the city at your own pace. On hot summer days, take your date to Splash Zone Water Park at the Family Aquatic Center. The water park is open daily after May 29 and includes 400 feet of water slides, a lazy river, a competition pool, and a "sprayground"—a jungle-gym-like area fashioned with water jets and pistols. It is also home to Ohio's first bowl slide, a water slide that shoots you into a spiraling cone before you fall from the center into a pool. Daily admission is just $7.00 for adults. More than one-hundred miles of scenic trails run through Springfield. The multi-use trails can be accessed through various locations in and around the downtown area. The Little Miami Scenic Trail is one of the longest trails accessible in Springfield, covering 78 miles all the way to Milford, Ohio. For a shorter ride, try the Buck Creek Scenic Trail, which runs from Plum Street to the Brown Reservoir. Pack a transportable lunch in a backpack and stop along the trail for a picnic and some nature-based sightseeing. Trails can be biked or walked. Wahlig, Hannah. "Cheap Dating Ideas in Springfield, Ohio." Dating Tips - Match.com, https://datingtips.match.com/cheap-dating-ideas-springfield-ohio-6458984.html. Accessed 20 April 2019.